As you thaw out from the Western North Carolina winter and move toward spring and summer, it is the perfect time to take your yoga practice outside of your comfort zone. To help you get started and inspire your next practice, we’ve listed 10 of our favorite places to practice yoga — outside of the classroom. The North Carolina Arboretum is 434 acres of public gardens that’s teeming with lush foliage, especially in the summertime. From 8 am to 9 pm every day, you can explore the glorious gardens of the North Carolina Arboretum, where more than 10 miles of picture-perfect hiking connect to some of Asheville’s premiere outdoor attractions including the Blue Ridge Parkway and Pisgah National Forest. Let go of your stress and take in a deep, cleansing breath of fresh air at scenic Beaver Lake, a picture-perfect escape in North Asheville. The scenic trail along the beachside offers a stunning view of both the lake and the mountains to keep your drishti as you flow through your practice. The French Broad River flows directly through the beautiful city of Asheville, and you can practice yoga alongside the gentle current at the French Broad River Park. The French Broad River Park trail is 2 miles long, and connects the French Broad Greenway with Carrier and Hominy Parks. Take a stroll along the paved sidewalk until you find a grassy spot that suits you, then park your mat and let your practice begin. Explore 10 incredible acres of lush foliage at the Botanical Gardens of Asheville. This not-for-profit garden is nestled in the Southern Appalachian Mountains, and with more than 600 species of plant and animal life, it’s one of the most biodiverse sites in North Carolina. Stroll along the well-kempt trails until you find a clearing for your practice, then enjoy the sense of peace and oneness with nature with each and every breath. Ready to put your balance to the test? Head to Southern Raft Supply, rent a stand-up paddleboard for $12, and flow through your favorite vinyasa on the French Broad River. We don’t advise trying paddleboard yoga if you are a newbie, and we suggest practicing with a partner for safety reasons. It’s a great way to connect with nature and refresh your practice on a beautiful sunny day! Fancy a hike or a bike ride before your practice? Head to DuPont State Recreational Forest and hike out to one (or three) of the many stunning waterfalls in the 10,000-acre park. Even if it’s as simple as taking a minute to stretch your neck in the middle of your workday, adding yoga to your workday can greatly improve your mood, posture, and overall health. If you can, step away from your desk for 15 minutes and flow through a sun salutation or two to reinvigorate your body and mind. If you haven’t already established an at-home yoga practice, now is the time to start! By adding yoga, meditation, and mindfulness practices to your daily routine — even when you can’t make it to the studio — you are setting yourself up for a positively radiant summer, rain or shine. 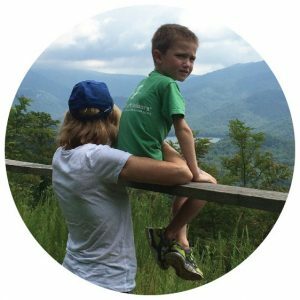 Yoga in the Park with Asheville Yoga Center is back! 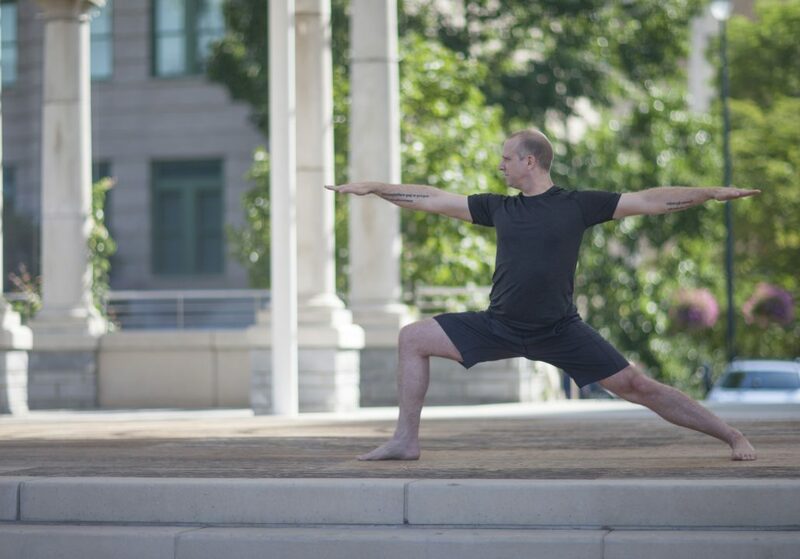 Starting on June 2, AYC’s incredible instructors teach free outdoor yoga classes at 10 am on select Saturdays at Pack Square Park. It’s an exceptional excuse to get outside and experience for yourself why people love Asheville, and why yoga practitioners love the instructors at AYC. When people talk about how yoga has changed their lives, I can add one more to that: yoga saved my life. You see, ten years ago, I was diagnosed with MS. I went from being someone who could go like the Ever-Ready bunny to a person who could barely walk down her driveway, to the mailbox. It was all of fifty feet away. For several years after the diagnosis, I struggled with not only loss of my physical self but loss of my happy, positive self. The person who always saw silver linings behind clouds now not only saw dark clouds, but I also saw two of everything. OK, so a full moon is beautiful, but when you look up at the sky and see two, you want to break down and cry. I know because I did. And then I moved to Asheville. I rented a little furnished apartment on Chestnut Street, right next to this little yoga studio. “Mom, you should try some yoga,” my son, Joe, who lives here, urged. He handed me a flyer to a free weekend of classes. “It couldn’t hurt to try one or two classes,” he said. The next day, I got up the nerve to put on some old sweatpants and a t-shirt and go to a basic class. I struggled to reach my toes. Down dog? Isn’t that for dogs? And what’s this at the end? Lie still and pretend you’re dead. Well, that one I could do! And then I kept going back. Twice a week. Then three times. Then as many times as I could. I couldn’t explain why, but something there at that little studio felt like a home I never knew. It felt like family to me. At the same time, I slowly felt connected to the self I had lost. The self who could only tremble at the thought of the future. Would I go downhill like most of the doctors predicted? outrageously happy. Yoga is fun! So what if I can’t stand on my head? So what if I have to go to the wall to balance? I can touch my toes. I can do a sun salutation and really send all of my gratitude up to the universe. I not only can do most every position (OK, take out Warrior Three), but I like doing them. And let’s not forget this other side to yoga. Positions are fun and fine, but my breathing has deepened. It has opened my heart and calmed down my fears. Every breath is a gift. And for me I can say, every step is a gift. Not too many people think about every step they take or how their feet line up in yoga the way I do. I’m on my feet! To me, that is a miracle in itself. 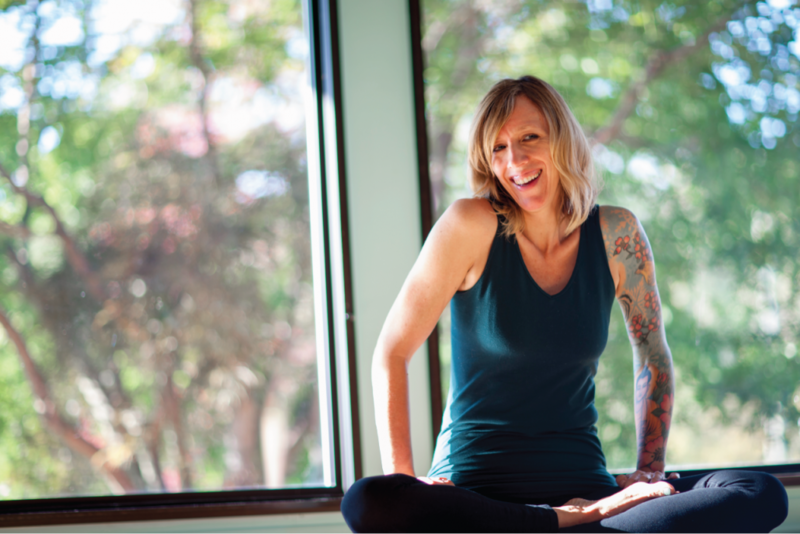 As E.M. Forster said, “Just connect.” And so, that’s why I do yoga: to connect to all that is greater than I am, to connect to people in class who are no longer strangers. To connect to the gratitude and compassion that surround and live within me. To laugh and be glad for all that I have instead of dwelling on all that I have lost. In fact, I can say this with great certainty: I haven’t lost anything. With yoga and all that if offers, I’ve gained more than I could have ever imagined. Life was good before MS. Life is better now — with yoga. Thank you, Asheville Yoga Center and all of your amazing teachers for bringing me back and beyond who I ever thought I could be.